Artist Emile-Antione Bourdelle (1861-1929) sculpted this bust. The head measures 24.25" and its base measures 15.25". The artwork resides in the entrance to Foellinger Great Hall in Krannert Center for the Performing Arts. It was a gift of Ellnora D. Krannert. 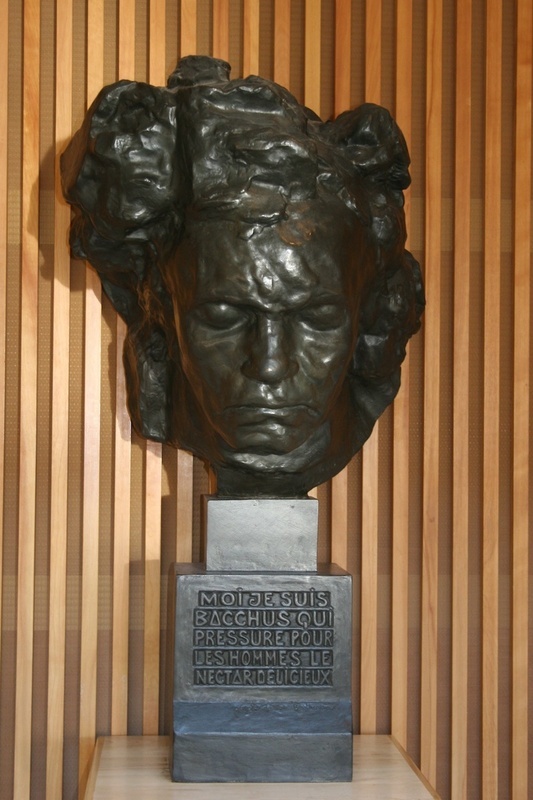 At the entrance to the Foellinger Great Hall of the Krannert Center for the Performing Arts is Bourdelle's strong, leonine bronze head of Beethoven, bent forward in intense concentration, brow furrowed, lips and eyes tightly shut, nearly black rippled surfaces catching and reflecting overhead light. The artist signed the work and inscribed on the base a quotation attributed to the composer: "Moi je suis Bacchus qui pressure pour les hommes le nectar delicieux" (I am Bacchus who presses delicious nectar for men). 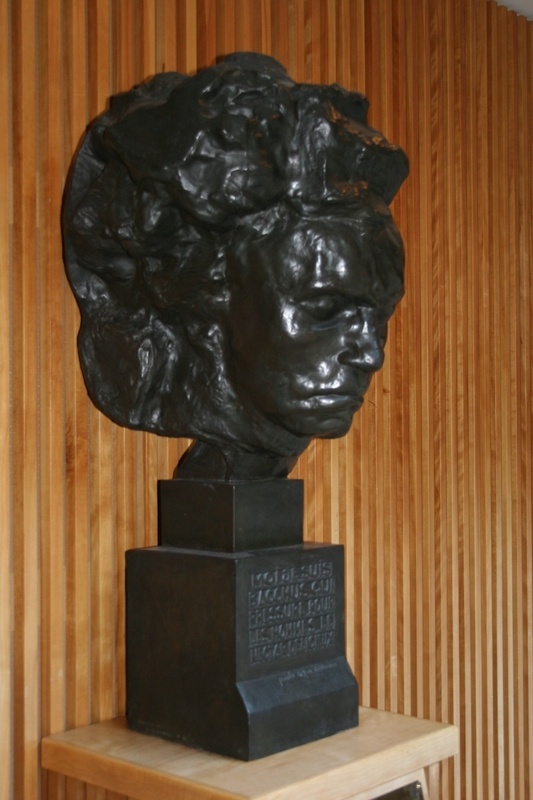 The sculpture is one of a series of some fifty portrait heads, masks, and hands of Beethoven done by Bourdelle from 1887 until the end of his life. Other castings of the Krannert head are in Lincoln Center and the Metropolitan Museum of Art, New York; Beethoven Hall, Bonn; and private collections. According to the Slatkin Galleries, which sold the work to the university, this cast was the third made. Bourdelle was born in Montauban, France. He left for Paris in 1884 to study successively with Falguiere, Dalou, and the great Rodin, who became a close friend as well as mentor. Finding inspiration in Greek archaic and Romanesque art, he combined the directness and simplification of those styles with something of the exaggeration of Rodin to invent an art of his own. A prodigious worker, Bourdelle created statues or busts of many of Europe's most prominent men. His greatest successes, however, were achieved with heroic and monumental works such as Hercules Shooting the Stymphalian Birds, the Monument to the American Dead of World War I, and the architectural reliefs for the Champs Elysees, Paris. The University owns other valuable Bourdelle sculptures: The Death of the Last Centaur at Robert Allerton Park, and the Penelope in the Krannert Art Museum. Muriel Scheinman, “Beethoven: Study for a Monument, 1902,” ExploreCU, accessed April 18, 2019, https://explorecu.org/items/show/37.